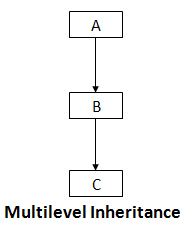 The class A serves as a base class for the derived class B which in turn serves as a base class for the derived class C. The class B is known as intermediate base class since it provides a link for the inheritance between A and C. The chain A -> B -> C is known as inheritance path. This process can be extended to any number of levels. Assume that the test results of a batch of students are stored in three different classes. class student stores the roll-number, class test stores the marks obtained in two subjects and class result contains the total marks obtained in the test. The class result can inherit the details of the marks obtained in the test and the roll-number of the students through multilevel inheritance. An example code would be be very helpful !! !